Hey that kinda smells like my wife, you dirty rat! New move? Finger up the nose, Moe, Larry, and Curly teach you that? … Is it just me or does he have too many fingers? Alex: … Is it just me or does he have too many fingers? I think the part that looks like a pointing finger is actually not supposed to be part of the hand. Maybe it’s a cigarette falling out of Green Hat’s mouth? But if it is really Red Coat’s finger, somebody needs to call Inigo Montoya. 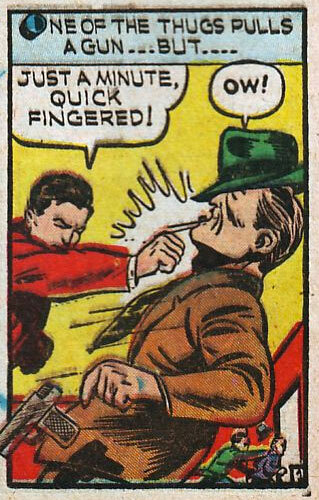 In two ticks he stretch his pistolfingers and in the next time he knock him down with a heavy punch hammer. He called that the worlds best knock out. But i hope he is not a kind of nosepicker. I begin to think that Target comics was staffed by guys who, if they’d been born a little later, would’ve been churning out underground comix alongside Bob Crumb and Gilbert Shelton. It’s like these Target guys were twisted on acid all. the. time. Phantom fingers; the HAT is saying OW! ; and what’s up with the two tiny guys under the gunman’s elbow? One’s giving the other the bum’s rush to off-panel. And I have personal recollections (albeit hazy) of colors not staying inside the lines, just like in this shot! (Whoa. Flashbacks…) All it needs is flaming eyeballs in top hats and Mr. Natural’s dad. I wonder if he got that nickname in prison.